Next, we simply had to point out the new three-story KFC that dwarfs the train station next door. Off to the Old City. And home, chatting with each other... Not shown: a black Lenovo behind the couch. Next, the beloved (for K anyway) highlight of Azerbaijan: the mud volcanoes. Surely it doesn't say "do not enter"? Next day we took the overnight train to Tbilisi, Georgia. Shock--new train cars, still Soviet style utilitarian but shiny clean and NEW. 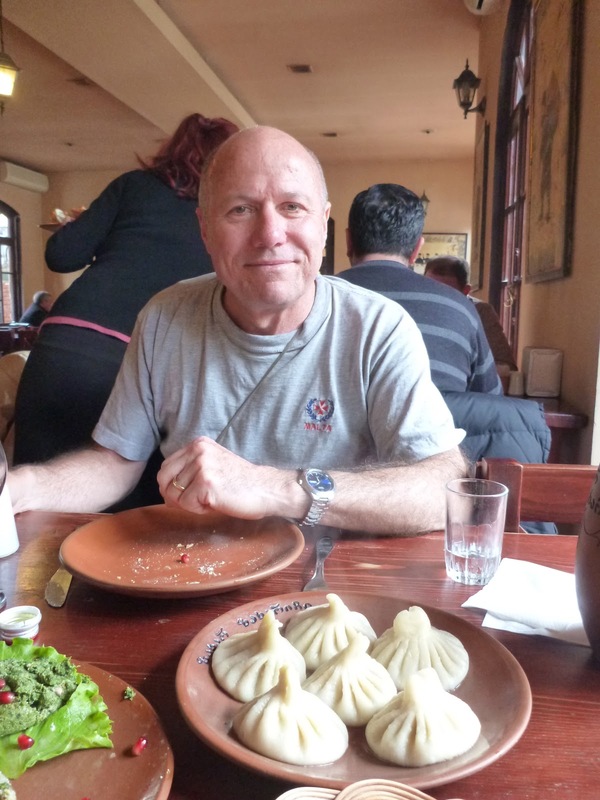 In Tbilisi we catch a marshrutka (van) for Borjomi, spa town famous for its mineral springs. 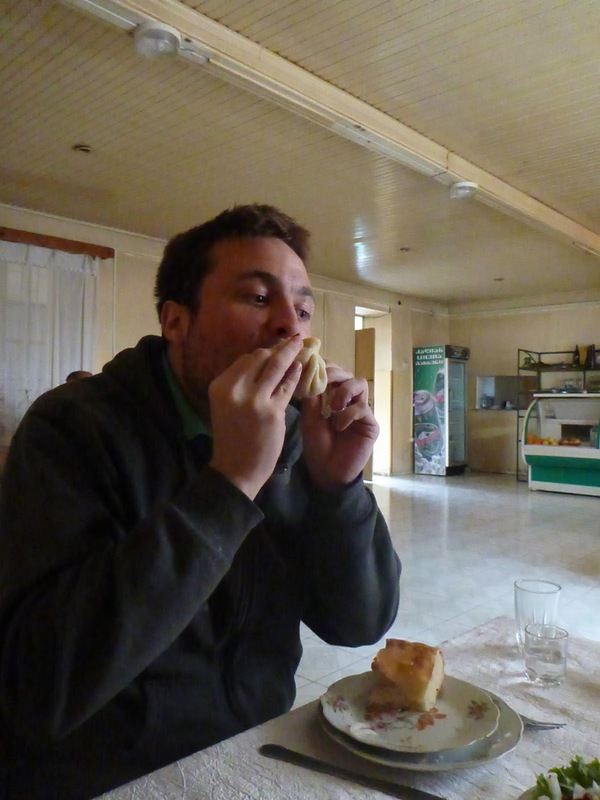 Here, Cam and Tom enjoy a taste, at the Green Church outside Borjomi. Borjomi is our base for a big day trip to the south. After the Green Church we stop at the newly and spiffily restored 12th century castle of Rabati, on a hill in Akhaltsikhe. 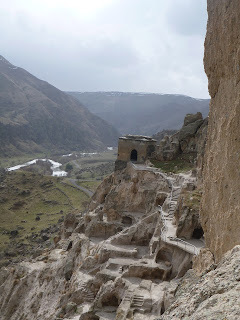 Our destination for the day, Vardzia , the incredible 12th C cave city that had 13 levels. Here it is from across a narrow valley. A quick trip, but so nice. Cam jets off on Turkish Air for New York, and we on Azal for Baku. The vegetarian meal I had ordered features….drum roll….chicken. I complain and am given a cheese plate from business class. Back in Baku, I see that the Az government has now outlawed the naming of babies with "Russian-sounding" names. So forget Mikhail and even Maria. And the person who led last month's demonstration has "disappeared". We have 10 more weeks here. Lənkəran and Astara, the southernmost cities of Azerbaijan, are both larger than I had expected, especially Astara, half of which is, we learned, on the other side of the river that forms the border between Az and Iran. Both cities have more of a town feel, few buildings over 4 stories, fairly wide streets with wide sidewalks (compared to Baku anyway) and lined with narrow but deep open ditches—watch it! Broad plaza parks, obligatory statues. Mostly all male tea houses (tea, cigarettes, backgammon) as elsewhere in Az, but we happen to pass by the back of different sort of tea place, selling pastries, with women as well as men at tables. From the street, as we pass by the kitchen in the back some women wave and smile--nice! Having spent the night on the train and longingly passed a number of all-male tea places (T was going to have us crash one of them but I was reluctant), we were especially happy to find this place and get some tea. Tea and pastries set us back 1.40 manat (~$2), where "tea" alone in Baku, served with lemon and jam whether you want it or not, can be 7 manat (~$10). We discover, more than a year and a half into our stay here, that if you don't want a Lipton tea bag you have to ask for samovar chai. Simply "chai" gets you Lipton's. Wandering Astara, on a wide street lined with shops selling mostly blankets and packaged goods, I vaguely wondered if this was the bulk purchase/wholesale part of the market. We see a small crowd of people at the end of the street. We are curious and walk past a modest barricade that prevents cars from entering. A man says "Drasvitye," Russian for hello, to which we don't respond, and then "Good Morning", which we answer in kind. We stay at the edge of the crowd, which contains both men and women, some in heels, trying to see what they are looking at. All we can see is a long metal cage, maybe 30 feet long and 10 feet high, empty. Are we waiting for a livestock auction? We move away, back through the market, and come to realize that this was an entrance to Az from Iran. There were no signs. Why a cage-like structure, metal on all sides? 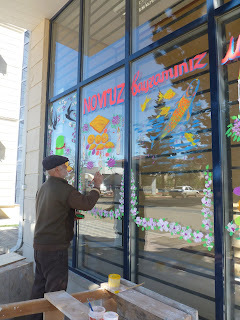 Down another street an artist painting sweet Novruz (Spring celebration) designs on a store front. He is happy to pose painting for me. 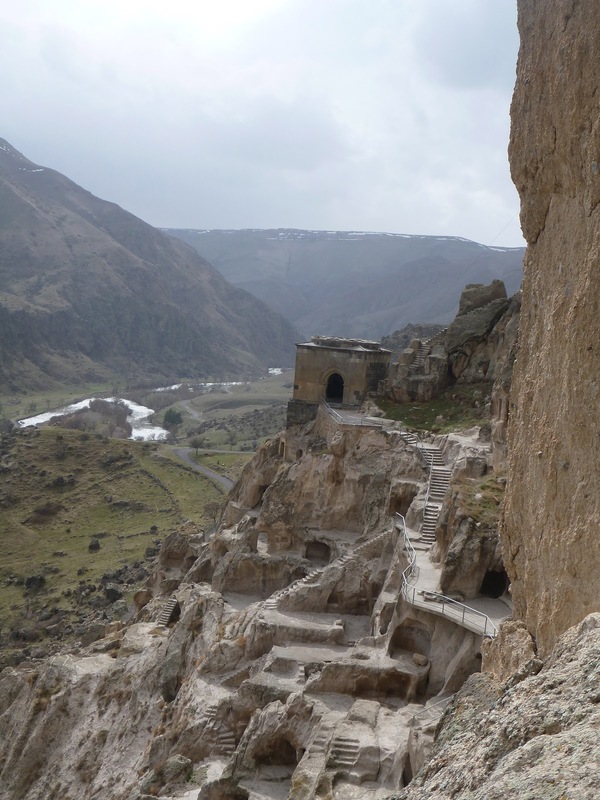 Back in Lankaran, the next day we pick a village to bus to and, hopefully, do a little hiking from. Score! T had selected Haftoni, which turned out to be an excellent choice. We waited close to an hour for a minibus with empty seats, traveled half an hour to the village terminus, then walked through a village and up onto the nearby hills to a lovely view of snow topped mountains on the left and the Caspian Sea to the right. At the bus station we noted the same ancient (50s? ), orange Soviet buses we had seen in enemy territory. There they sport numerous tanks of LPG on their roofs. Here in oil land, no. Here is T on the shore of the Caspian, Elliot Azerbaijan book in hand, later that day. We stopped in a shop and bought some great looking Iranian halvah (on the left). The sesame seeds are not crushed as in other halvah. The pastry on the right is also called halvah but bears no resemblance to the more widely known type and is from Sheki, Azerbaijan. Sticky and yum. Same old same old in Baku. (How blasé I must sound to those in more settled lives in the US!). Take my daily commute. 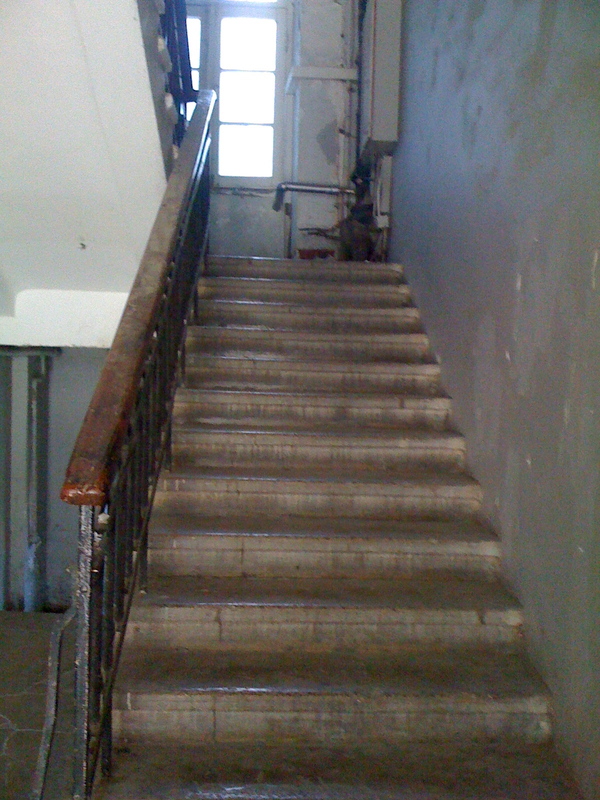 Down four flights of mostly unlit steps and across the rough entry way (someone next door had dug up the pavement to install some kind of pipe, and never replaced the pavers at our building's entrance). Down the street, through vehicles filled with children and their drivers pulling up to a school, then past the school walking against a throng of children arriving on foot. Then the first test of the day: crossing the main street. There used to be a crosswalk, but it was removed when the street was repaved. Not that it helped, really, but did give a welcome psychological boost at least. BMW police cars whiz by, as other vehicles, heedless of pedestrians. Once in a while a car will stop and wait for me, their kindness almost bringing me to tears because it is lovely and rare and welcome. Usually I dart halfway, holding my breath. On lucky days there is another person crossing at the same time. Safety in numbers. What chances people take. What are the traffic death statistics here, morbid curiosity wonders. On through the manicured park with its mature trees brought from Europe many decades ago. . 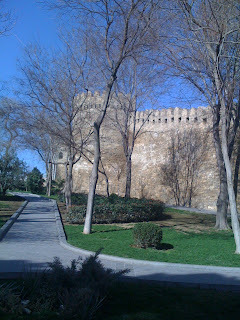 The park is extra-atmospheric as it lies adjacent to the ancient city walls. One day, the muzak piped into an ornate fountain plaza has been inadvertently left on all night. A bit bizarre at 7:30 a.m. One is tempted to sort of waltz along. It is loud! There are several pairs of parakeets (?) , no doubt descendants of one that must have been set free sometime in the past and have miraculously survived Baku winters. When the weather starts to warm they venture out, and may even splash about in the upper tier of the fountain. Not today--maybe they don't like the Muzak. On to the Metro through its dramatic Louvre-like glass pyramid entrance building. A full four minutes of my/everyone's commute devoted to descending the escalator into the bowels of the Old City., entertained by LED lights along the sides that change color every few seconds. The Metro is efficient. Cars are old Soviet bare bones hulks. I love that a different tune is played arriving at each station, hear your tune and come to--time to get off. Three stops for me, then a bus. I have a choice of three buses. My favorite is the least frequent, so it's a treat should it come. It takes me across a street nearest to the school where I work. One more crossing adventure… The second drops me on a main street--I have to ask for the bus to stop there, which they are fine to do if they understand what you want :-)--which I walk down weaving through a bunch of parked cars and uneven pavement but only a few puddles if it has rained. The third, most frequent, bus drops me at the end of a formerly paved street rife with muddy potholes, wandering chickens, and sometimes bleating sheep in pens or trucks alongside. I think there is a butchery. If it has rained it is really unpleasant. In this area live refugees from Nagorno-Karabagh. 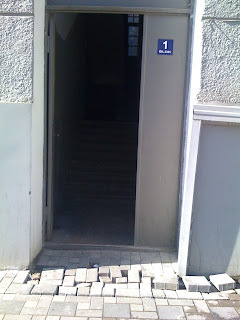 The school has no sign. 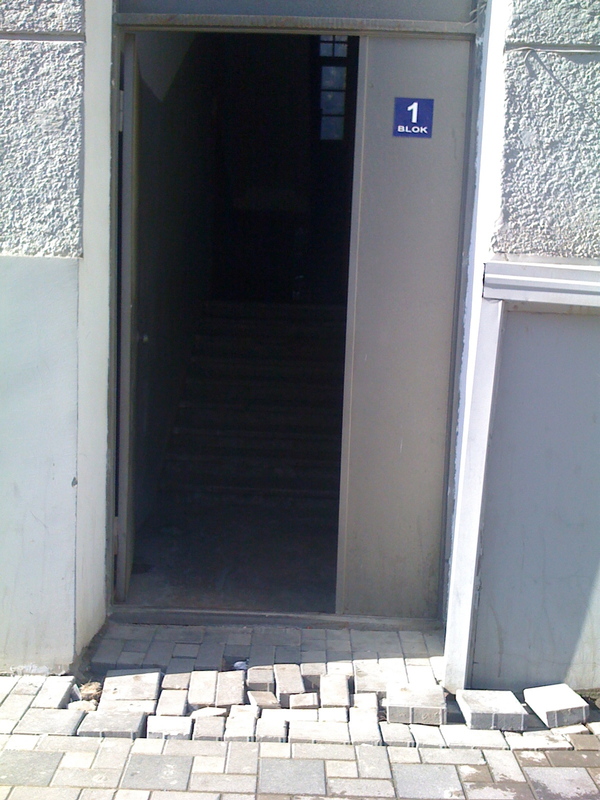 Although a major and well known international school, it is not registered with the government. Looking forward to life in the tropics in well-ordered Malaysia, though that is not yet 100% for sure. The school in Penang clearly wants T for the job, has sent a welcome packet and is asking to arrange air tickets, but we still don't have a contract in hand. Their board was reviewing salaries for next year, and now the contracts are with a lawyer for review. Hopefully soon it will be settled.